SUMMARY: Tinnitus affects 10% of the US general population and is a common indication for imaging studies. We describe a sequential compartment-based diagnostic approach, which simplifies the interpretation of imaging studies in patients with tinnitus. The choice of the initial imaging technique depends on the type of tinnitus, associated symptoms, and examination findings. Familiarity with the pathophysiologic mechanisms of tinnitus and the imaging findings is a prerequisite for a tailored diagnostic approach by the radiologist. Tinnitus is defined as an auditory perception of internal origin, usually localized and rarely heard by others.1 It is a common presenting symptom, affecting up to 10% of the US general population. It is most prevalent between 40 and 70 years of age, has a roughly equal prevalence in men and women, and can occur in children.2 Tinnitus may be classified as subjective versus objective and pulsatile versus continuous. Pulsatile tinnitus is a discrete repetitive sound that is synchronous with the patient's pulse. Continuous (or nonpulsatile) tinnitus refers to all other rhythms, usually a constant unrelenting noise. Objective tinnitus is audible to the examining/auscultating physician, whereas subjective tinnitus can only be perceived by the patient. Nonpulsatile tinnitus is almost always subjective, whereas pulsatile tinnitus can be subjective or objective. There is a general consensus that a contrast-enhanced high-resolution CT of the temporal bone should be the initial imaging study for pulsatile tinnitus.10–12 If CT findings are negative, further investigations may still yield abnormalities in 30%–40% of patients.6,7 These include carotid sonography to exclude stenosis1; contrast-enhanced neck CT angiography to exclude carotid stenosis, dissection, mass, or a compressive lesion in the neck or superior mediastinum2; and conventional angiography to rule out a dural AVM, AVF, and other vascular abnormalities of the extracranial carotid arteries.3,6,13 Contemporary MR angiography protocols include time-resolved imaging of contrast kinetics,14,15 a technique that can demonstrate most vascular lesions without the risks of conventional angiography. A list of various common and uncommon causes of tinnitus is provided in On-line Table 1. In the following pages, we have categorized different conditions that can cause tinnitus according to the anatomic location of the most conspicuous imaging abnormality. A systematic approach in the evaluation of tinnitus not only facilitates a logically organized search for abnormalities but also helps in careful exclusion of pertinent differential diagnoses once an abnormality is identified. A summary of major causes categorized by anatomic location is listed in On-line Table 2. Extracranial AVMs can rarely cause pulsatile tinnitus.16 An enlarged external carotid artery branch may be an important clue to an associated intracranial AVM or dural AVF fed by its branches.17 Manual compression of an artery that was seen as mildly enlarged on imaging may suppress or even completely eliminate tinnitus, thereby localizing the origin of the symptoms. The differential diagnosis of middle ear masses that may present with tinnitus includes glomus tympanicum, glomus jugulotympanicum, aberrant or dehiscent ICA, jugular bulb variants, and, rarely, cavernous hemangioma of the middle ear. Radiologic findings associated with persistence of the stapedial artery are included in the section on skull base foramina. Glomus tumors are vascular paragangliomas located in close proximity to cranial nerves. Glomus tympanicum, the most common tumor of the middle ear cavity, usually arises along the course of the tympanic nerve (Jacobson nerve). Glomus tumors are most frequently located on the cochlear promontory (Fig 1) but can arise almost anywhere in the medial mesotympanum.18 The typical appearance of a glomus tumor on temporal bone CT is a round mass based on the cochlear promontory. On MR imaging, these tumors show intense enhancement. Glomus tympanicum usually does not cause erosion of the underlying bone; if the floor of the middle ear cavity is eroded, a glomus jugulotympanicum should be considered (described in the section on jugular foramen masses). Unlike paragangliomas elsewhere in the body, glomus tumors are usually solitary, and the detection of such a lesion does not indicate a need for further imaging to search for additional tumors. 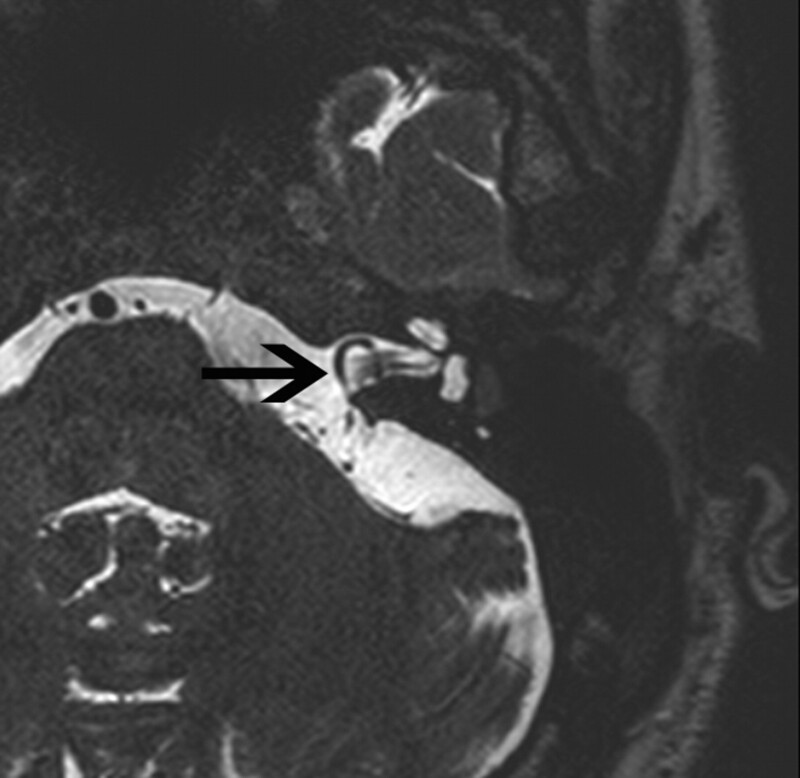 Glomus tympanicum (arrow) in a 30-year-old woman with right-sided pulsatile tinnitus. 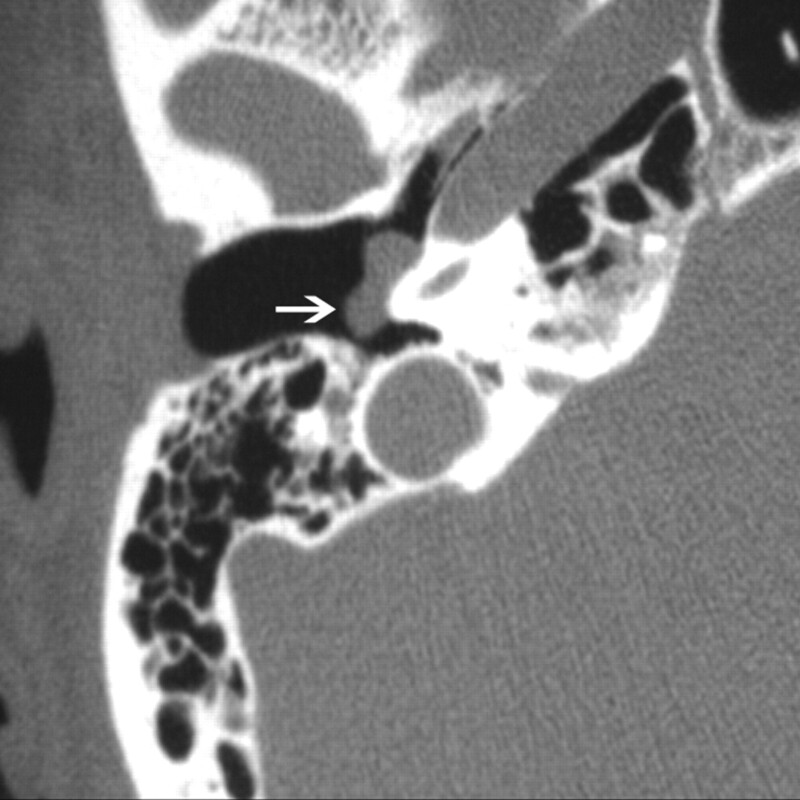 Axial CT image demonstrates lobulated soft-tissue attenuation in the middle ear overlying the cochlear promontory. The etiology of aberrant ICA is hypothesized to be an abnormal regression of the cervical ICA during embryogenesis. The inferior tympanic artery, a branch of the ascending pharyngeal artery, undergoes compensatory enlargement and anastomoses with the caroticotympanic artery in the middle ear and then resumes the usual course of the ICA in the petrous part of the carotid canal. Aberrant course of the ICA in a 25-year-old man presenting with pulsatile tinnitus. 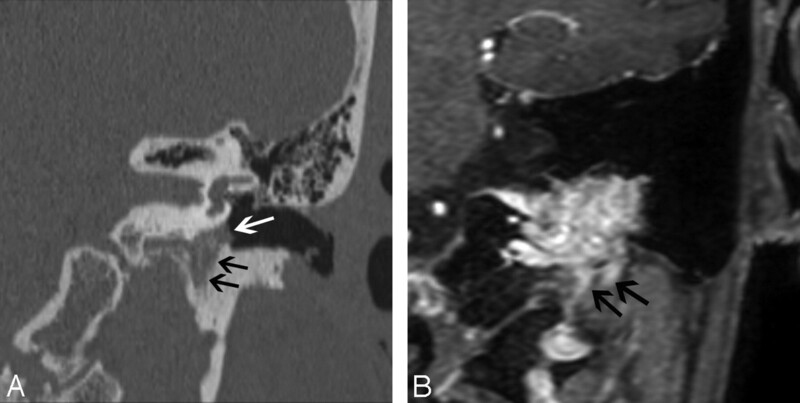 A, Enhanced axial CT image demonstrates an abnormal lateral course of the right ICA through the middle ear (white arrow). Also note dehiscence of the overlying bony plate. B, Anteroposterior projection image from the MR angiogram of the same patient demonstrates decreased caliber and lateral deviation of the aberrant ICA on the “right reversed-7 sign” (black arrow). 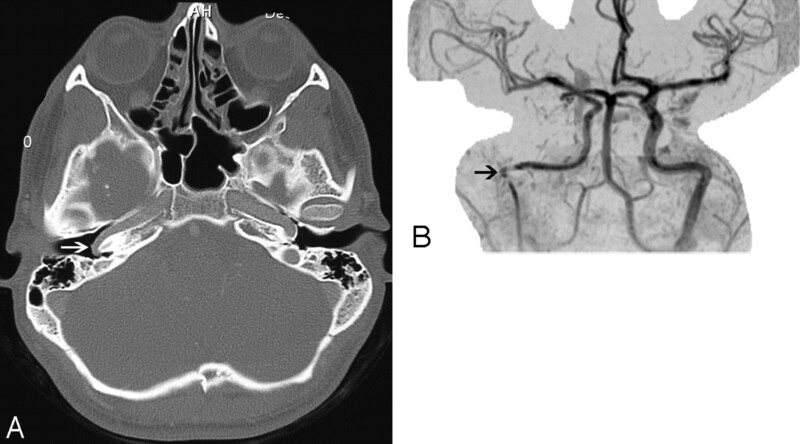 An ICA with a normal course may have a focally dehiscent carotid canal, though this is less common than dehiscence in the setting of an aberrant ICA. The genu of the vertical and horizontal petrous ICA segments lies more laterally and posteriorly, with associated lateral wall dehiscence. The dehiscence is usually near the basal turn of the cochlea. Dehiscence of the jugular bulb is a normal venous variant, in which a superolateral extension of the jugular bulb extends into the middle ear cavity through a dehiscent sigmoid plate. Otoscopically, this is seen as a blue mass behind an intact tympanic membrane, which may become distended on Valsalva or ipsilateral jugular compression. A jugular bulb diverticulum is defined as a focal polypoid extension of the jugular bulb superiorly (or, less commonly medially, anteriorly or posteriorly) into the deep temporal bone just behind the IAC, with an intact sigmoid plate. A “high-riding jugular bulb” is defined as an extension of the most cephalad portion of the jugular bulb superior to the floor of the IAC. Although jugular bulb variants have been associated with tinnitus,21 the causal association of these variants with tinnitus remains controversial.6,8,12 When one of these variants is found in a patient with pulsatile tinnitus, a search for other treatable causes should still be made. Cavernous hemangioma is a rare benign neoplasm of the middle ear, which can rarely cause tinnitus and mimic a glomus tympanicum clinically, radiographically, and otoscopically.22 Middle ear hemangiomas should be differentiated from the more common geniculate ganglion hemangiomas, which usually present with facial nerve palsy23 but may rarely cause pulsatile tinnitus.24,25 The diagnosis is often possible only at surgery. Several temporal bone lesions have been associated with tinnitus. These have the following classifications. Fenestral otospongiosis in a 35-year-old woman with hearing loss and tinnitus. Axial CT image demonstrates soft-tissue attenuation in the oval window (white arrow) and abnormal lucency at the fissula antefenestram (black arrow). A 50-year-old man with cochlear otospongiosis. 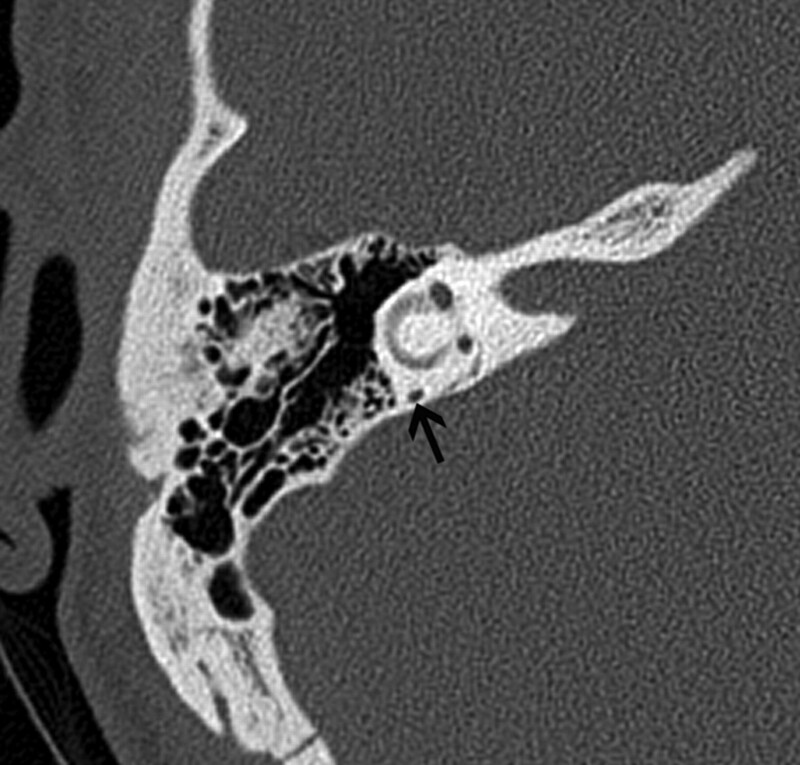 Axial CT scan demonstrates abnormal lucency surrounding the left cochlea (black arrows). Paget disease of the temporal bone can rarely cause pulsatile tinnitus.27 As in otosclerosis, the development of intraosseous arteriovenous shunts may be the contributing factor. However, unlike otosclerosis, Paget disease is characterized by diffuse involvement of the skull base, producing a cotton-wool appearance (Fig 5). Paget disease of the skull base in a 70-year-old man. Axial CT scan demonstrates diffuse expansion and sclerosis of the bones of the skull base, characteristic of Paget disease. Note the sparing of the maxillofacial bones, which, along with the age of the patient, is a helpful feature in differentiating it from fibrous dysplasia. Intraosseous temporal bone meningioma in a 45-year-old woman who presented with left-sided hearing loss and tinnitus. 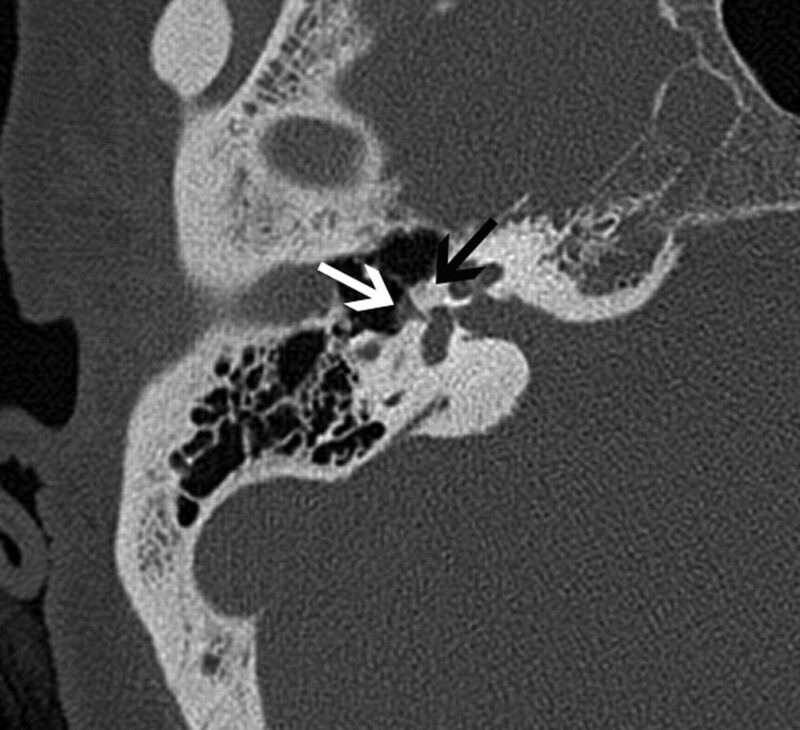 A, Axial CT image demonstrates diffuse sclerosis of the temporal bone and soft-tissue attenuation (black arrows) in the left mastoid and middle ear cavity. B, Axial enhanced MR image in the same patient demonstrates enhancement within the left middle ear (white arrow). A 50-year-old man with MD. Axial thin-section CT image shows decreased distance between the vertical limb of the posterior semicircular canal and the posterior edge of the temporal bone (black arrow). Absence of the carotid canal and enlargement of the inferior tympanic canaliculus are often associated with an aberrant ICA. These signs should trigger a careful examination of the ICA through the middle ear to confirm the diagnosis (as discussed in “Middle Ear”). Absence of the foramen spinosum and enlargement of the proximal tympanic facial nerve canal may indicate the presence of a PSA (Fig 8A–C). The stapedial artery is normally present in the fetus but undergoes regression before birth. It arises from a normal or aberrant ICA (approximately 30% of all aberrant ICAs are associated with a PSA). The PSA typically runs through the obturator foramen (the space between the crura of the stapes) and across the promontory in the middle ear, where it can sometimes be identified. The PSA then runs along the tympanic portion of the facial nerve canal near the geniculate fossa, finally exiting the facial nerve canal to enter the middle cranial fossa to become the middle meningeal artery. A 30-year-old man with PSA. 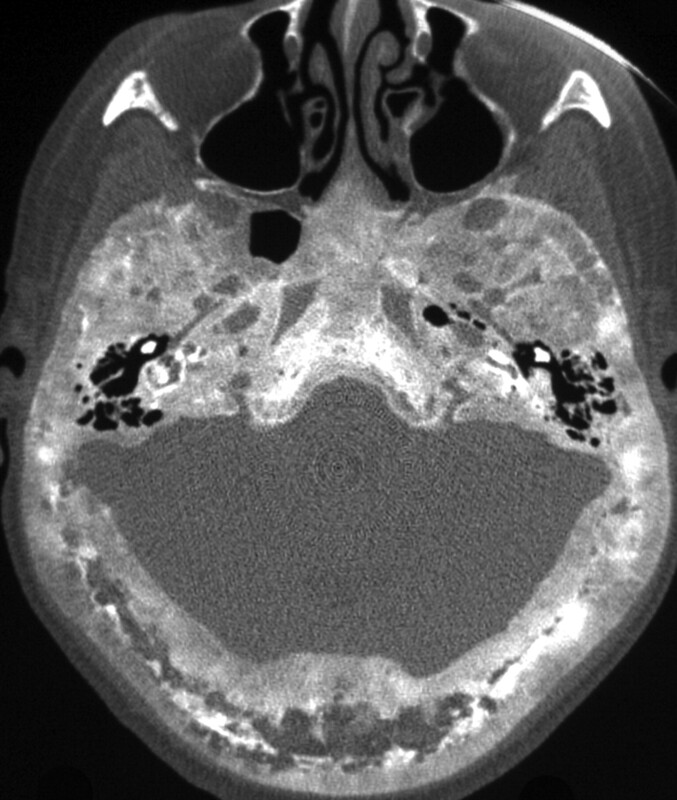 A, Axial CT image demonstrates absence of the foramen spinosum bilaterally (black arrows). B, Coronal CT image in the same patient shows enlargement of the tympanic part of the facial nerve canal, another indirect imaging sign of PSA. C, Lateral DSA image of the internal carotid injection shows the PSA arising from the ICA (arrows). When the stapedial artery persists beyond the fetal period, the middle meningeal artery does not develop from the internal maxillary artery and the foramen spinosum remains undeveloped. The absence of the foramen spinosum is an important CT finding that should alert the radiologist to a possible PSA (Fig 8A). However, these findings do need to be interpreted cautiously because the foramen spinosum may be absent in ≤3% of all skull base CT studies.35 The presence of additional signs such as a subtle enlargement of the tympanic segment of the ipsilateral facial nerve canal on coronal CT images, just inferior to the lateral semicircular canal, may raise the index of suspicion (Fig 8B), and DSA can be used for confirmation (Fig 8C). Most patients with a PSA remain asymptomatic and only rarely present with pulsatile tinnitus. The physical examination in some patients may show a red retrotympanic mass, which may provide useful clinical correlation for the imaging findings. Glomus jugulare paragangliomas arise in the jugular bulb and can aggressively erode the bone of the lateral jugular bulb to extend toward the middle ear. On CT, the presence of permeative bone erosion of the superolateral jugular foramen wall is an important diagnostic clue (Fig 9A). Jugular spine erosion is also common. On MR imaging, large flow voids interspersed with high-signal-intensity parenchyma provide a characteristic “salt and pepper” appearance. Enhanced MR imaging may provide a better estimate of the extent of the mass (Fig 9B). Angiography shows enlarged feeding vessels, a prolonged and intense vascular blush, and early draining veins from arteriovenous shunting. Glomus jugulotympanicum in 45-year-old woman who presented with left-sided pulsatile tinnitus. A, Coronal CT image demonstrates soft-tissue attenuation projecting in the hypotympanum (white arrow). There is permeative osseous destruction in the left jugular foramen (black arrows), providing a clue as to the origin of the mass in the left jugular foramen. 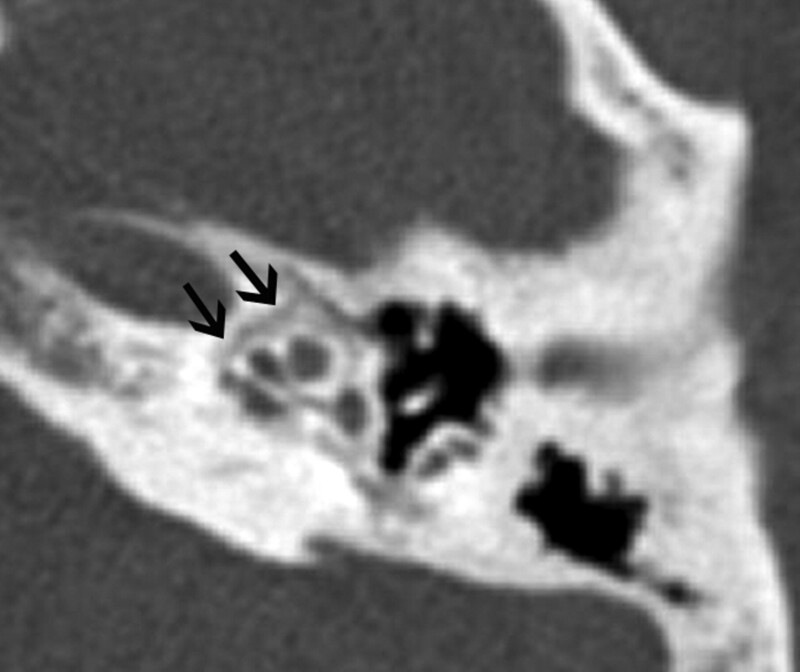 B, Enhanced coronal MR image better demonstrates the true extent of the mass within the left jugular foramen (black arrows). Vestibular schwannomas are the most frequent CPA masses causing tinnitus. Although the pathophysiology of tinnitus in these patients is not well understood, compression of the cochlear nerve or of its arterial supply is known to cause sensorineural hearing loss and is presumably the cause of the tinnitus as well. Other enhancing CPA masses such as meningiomas, facial or trigeminal nerve schwannomas, and exophytic brain stem gliomas are less likely to present with tinnitus. Aberrant Anterior Inferior Cerebellar Artery Loops. Vascular loops in contact with the vestibulocochlear nerve are considered to be a normal anatomic variant (Fig 10). However, subjects with pulsatile tinnitus have an 80-fold higher chance of having a contacting vascular loop than patients with nonpulsatile tinnitus.40,41 The pathophysiologic role of these loops in tinnitus is unclear. Anterior inferior cerebellar artery loop in a 35-year-old man. Axial T2-weighted MR image shows a vascular loop entering the IAC (black arrow). Palatal myoclonus, a cause of muscular tinnitus, is myoclonus of the tensor and levator veli palatini, tensor tympani, salpingopharyngeus, and the superior constrictor muscles. Cerebellar and brain stem diseases (multiple sclerosis, infarcts) cause palatal myoclonus.44 Palatal myoclonus may also occur as an isolated nonprogressive abnormality. Middle ear myoclonus, the other cause of muscular tinnitus, results from rapid rhythmic contractions of the stapedius and tensor tympani muscles and does not have specific imaging correlates. IIH has been reported to be the most frequent diagnosis in patients with pulsatile tinnitus.46 Imaging findings may be normal, but studies are useful to exclude other causes of increased intracranial pressure. An elevated opening pressure at lumbar puncture confirms the diagnosis. Intracranial hypertension in a 30-year-old woman presenting with headaches and tinnitus. A, Axial T2-weighted image demonstrates dilation of bilateral optic nerve sheaths (arrows) and flattening of the posterior globes. B, Coronal maximum-intensity-projection image from an MR venogram also demonstrates stenoses of bilateral transverse sinuses (arrows). AVM may be extracranial, dural, or parenchymal, and any of these varieties may be responsible for tinnitus.51,52 Signs on CT or MR imaging include the presence of flow voids in the brain parenchyma, evidence of prior hemorrhage on gradient refocused-echo images, abnormal flow patterns, and flow voids in dural venous sinuses, which appear enlarged. However, these findings are not present in most cases, and DSA is the technique of choice whenever an AVM is suspected. Dural AVMs or AVFs are the most frequent cause of objective pulsatile tinnitus in the patient with normal findings on otoscopic examination.6 In contrast to AVMs that have a nidus composed of a tangle of vessels, dural AVFs usually have a direct communication between an artery and a vein without an intervening nidus. The transverse, sigmoid, and cavernous sinuses are the most frequent locations of dural AVMs and AVFs. Branches of the external carotid artery supply these dural AVMs; venous drainage may be extracranial, intracranial, or both. Conventional angiography is the most sensitive imaging tool. A 40-year-old man who presented with left-sided pulsatile tinnitus. 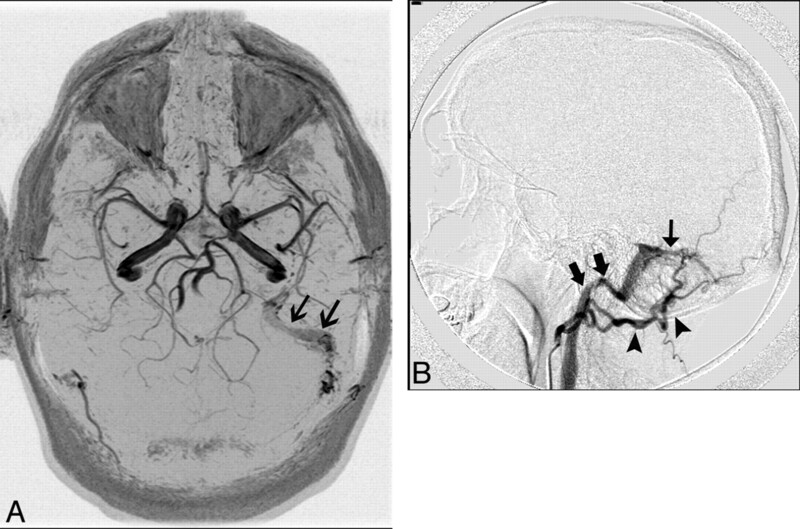 A, MR angiogram demonstrates asymmetric increased flow-related enhancement in the left sigmoid sinus (black arrows) and multiple small arterial flow voids within it. B, Lateral projection of DSA shows injection of the left occipital artery (arrowheads) opacifying the AVF (thin black arrow) and rapid opacification of the left sigmoid sinus and internal jugular vein (thick black arrows). Carotid Artery Dissection or Stenosis. The turbulent flow that arises from a carotid dissection or atherosclerotic stenosis may cause tinnitus.54 CT angiography may show a typical intimal flap within the arterial lumen. MR imaging is more sensitive for dissection than CT, and unenhanced fat-suppressed T1-weighted images can optimally demonstrate a hyperintense thrombus in the false lumen. A periluminal crescentic focus of high signal intensity (“fried-egg” sign) on axial images is characteristic of carotid dissection. Fibromuscular dyplasia is an idiopathic inflammatory angiopathy affecting medium-sized vessels. ICAs are the second most common arteries affected; the renal arteries are the most common. Patients most frequently present with brain ischemia, but tinnitus is the next most frequent manifestation.55,56 CT or MR arteriography can confirm the diagnosis. Conventional angiography is helpful if angioplasty is being considered. The arteries have a characteristic beaded appearance from multifocal stenoses separated by regions of variable dilation. Although venous hums are common in asymptomatic persons,57 the compression of the jugular vein in the neck or mediastinal venous compression may cause tinnitus due to turbulent blood flow. When a detailed CT or MR imaging study of the temporal bone fails to disclose a cause for pulsatile tinnitus in a patient, it may be useful to image the neck and the superior mediastinum to search for a mass compressing the internal jugular vein anywhere along its course. TMJ degeneration is often overlooked as a potential cause of head and neck symptoms. Patients with degenerative disease of the TMJ may present with continuous tinnitus.58,59 The mechanism for this relationship is not well understood. The tension in the pterygoid muscles, which are attached to the TMJ, may increase tension in the tensor tympani, possibly mediated by their common innervation through the mandibular division of the trigeminal nerve. MR imaging is the preferred technique for TMJ assessment. Many patients will have no radiologic abnormalities than can explain their tinnitus. On the other hand, many radiologic findings associated with tinnitus are also seen frequently in asymptomatic individuals. The correlation of imaging findings with clinical symptoms remains a critical step before suggesting that a particular radiologic finding may be responsible for a patient's tinnitus. A compartment-based approach in the imaging evaluation helps to analyze systematically the various imaging modalities, which will prevent missing any important finding that may be a potential cause for tinnitus. The authors acknowledge Ms. Pat Moore, Information System Specialist, Radiology Administration Section, University of Alabama at Birmingham for her help with the illustrations. S. Vattoth and R. Shah are co-first authors.